Beef for me, no doubt about it. Check out this trailer for a hint at what Brazilian big-wave rider and Finisterre ambassador Carlos Burle might say. You can see the rest of Greg Robinson's impressionist documentary (and find out how to win up to £250 worth of Finisterre's new product line) at www.finisterreuk.com/beef-or-salmon/. The film was shot last October when Burle was with Finisterre on a "Cold Water Frontiers" trip to Ireland. It's killer. It seems that in this world of rumour, counter-rumour, gossip, invention, fiction and spin, only two things are true. One, that Kelly Slater is not, contrary to a story that originated in the Antipodes, retiring, and two, that one day, when he has had enough of the pro contest scene, Kelly Slater will retire. For now, though, the Floridian superstar has scotched the speculation, saying that he has no idea where all the fuss came from. This was, then, the story that wasn't a story (and hey, am I glad that I ran it with a big old question mark rather than as a statement of fact), but meanwhile, back in the real world, something else is true: Andy Irons has won the Rip Curl Pro Search Chile. The Hawaiian - the man who has pushed Slater harder than any other surfer - eliminated Asutralia's Mick Fanning in his semi-final and secured a convincing win over Damien Hobgood in the final. The facts, it's all about the facts... Here's another: it's the launch of Surf Nation tonight at The Secret Spot in St Ives and I'm nervous. Public speaking ain't my thing but tonight it might have to be. I feel a therapeutic skate at Hayle bowl coming on beforehand. Meanwhile, big thanks to Rhona Gardiner and Big Friday for Wednesday's bash at the Oakley Store in Covent Garden. A fine evening and thanks to everyone who came along. Quiksilver, Slater’s major sponsor, declined to comment. The Floridian is currently sitting in sixth position and it is becoming increasingly unlikely that he will be in contention for a ninth world title. Slater fell victim to Coolangatta’s Dean Morrison in a much anticipated Round 4 match-up of the Rip Curl Search Pro Chile. Needing a wave-score of 9.37 to progress through to the Quarter-finals, time got away from him, which gave Morrison a much-needed victory. The Big Rumour: Slater to Retire? No sooner had I completed a post on the day's action at the Rip Curl Pro Search Chile than a trusted source contacted me to tell me that Kelly Slater has retired from professional surfing with immediate effect. Apparently the 35-year-old superstar - the only man in surfing aside from Laird Hamilton to achieve anything near household name status outside the sport - was so disappointed to exit the Rip Curl event that he booked himself straight onto the next flight out of Chile to the U.S. It's said that the Floridian has no interest in continuing on the pro tour. If this is true, pro surfing will lose the man who holds the record both as its youngest and oldest champion, not to mention its record-setting eight-time world championship winner. Slater has retired before - between 1999 and 2002 - but this time it might just be for good. Watch this space. There are those (Rabbit Bartholomew among them) who reckon this is The Year of the Aussie. That belief must have been bolstered with the elimination today of Kelly Slater in Round Four of the Rip Curl Pro Search Chile - by an Australian, no less. The eight-time world champion fell - just - to Dean Morrison with fellow Australians Mick Fanning and Joel Parkinson also progressing to the Quarter-Finals. There, though, Parkinson was vanquished by the man who has come closest to Slater in recent years, Hawaii's Andy Irons. The remaining Quarter Finals will see Fanning take on Bobby Martinez, Morrison against CJ Hobgood and Brazil's in-form ripper Bruno Santos do battle against Damien Hobgood. Here's a video from Day One's action to show what a quality wave the pros have been enjoying. Check out these images from the Rip Curl Pro Search currently being held at Arica, the Chilean Pipeline. As you can see, the swell has been pumping, so much so that the event organisers had to put the contest on hold for a couple of days. Once it resumed world-class surfing was the order of the day. For example: the stylish, powerful bottom turn opposite by CJ Hobgood, and the charging barrel ride of rookie sensation Kai Otton (both pictures courtesy of Rowland/ASP Covered Images). Some incredible tube rides have been witnessed with one or two big names going out, including Taj Burrow, defeated by Brazilian Bruno Santos, and Bruce Irons, who fell to CJ Hobgood. Kelly Slater and Andy Irons are both looking good, so too current ASP World Tour leader Mick Fanning. Two heats in Round Three remain. The likeable, poker-playing Royden Bryson will do battle against Damien Hobgood, while Travis Logie will face his countryman Ricky Basnett. Next call is at 7.00 a.m tomorrow and footage can be seen on www.ripcurl.com. If the swell is as good as it has been so far, the crowds of stoked onlookers are in for another treat. To Hayle Skate Park this afternoon and the Lusty Skates shop run by Oz. This is possibly the only skate shop adjacent to a skate park in the UK, and what a place: a core skater's shop, run by a skater and catering for what skaters want. It perfectly complements the superb skate park at Hayle and given the all round good vibes I guess it was inevitable that I lashed out and bought a new Creature deck with Indy trucks and some slick spanking new OJs. Yes, an old skool set-up if ever there was one. A few happy hours later I hadn't acquired yet another skating injury and my sons, already stoked after another excellent morning's surfing thanks to the Sennen Surfing Centre, had experienced that no doubt great joy of Bonding-With-DAD-Via-Skateboard. Meanwhile, before the next instalment of my return to skating in earnest, here is some educational footage that my boys and I have been enjoying. Every now and again I’ll go surfing at a local beach and something, maybe the tang of salt spray from the breaking waves or the wail of a gull swooping overhead, will transport me back to my first surf sessions in Pembrokeshire over 25 years ago. And that brief trip back in time is enough to remind me that much of what was best about that period still lingers indefinably in the air today. It was a time when many local surfers left familiar Pembrokeshire waves for the first time and went off either with friends or alone on ‘surfari’ to discover the waves and cultures of Europe’s Atlantic coasts, Sri Lanka, Indonesia, Australia and the South Pacific, a pilgrimage that is now an annual event for many young – and not so young – surfers. I'm well and truly stoked not only by one joyous wave this afternoon - a right that seemed to go on forever, which compensated for some tired, error-prone rides the rest of the time - but by the good folks at The Secret Spot in St Ives. Owners Geoff and Rowena Swallow - the parents of up and coming 13-year-old ripper Tassy - have made available their gallery space for an exhibition of the photographs that appear in Surf Nation. There are 22 chapters, so that's 22 photographs. More, in fact, thanks to the cover and inside jacket shots. Whatever you think of the text (I'm bracing myself...) there's no doubting the quality of the images. The work of the likes of Al Mackinnon, Roger Sharp and Alex Williams is well known and they're joined by a host of other top snappers. Many of the shots were chosen precisely because of their innately British or Irish feel; because they capture so well what it's like to surf here on a regular basis; and because they often subvert preconceptions about surfing. The exhibition at The Secret Spot runs from this Saturday until the end of August. Here are a couple of the images for starters. Penzance photographer Greg Martin was on form to capture the moody landscape behind Glen 'Micro' Hall as he lined up a Hebridean wall; so too Porthcawl's Peter Britton when he caught Tom Anderson and friend, stoked at the steel works. See www.secretspot-stives.com for more information. As a schoolboy I was always fascinated by Chile. I loved the simple fact that it was so long and thin. Later, during my year in Australia, I came across Jacobo Timerman's magnificent book, Death in the South, a meditation and report on life in Chile under Pinochet. Despite the horrors of the Pinochet regime, the book was incredibly moving and made me want to go to Chile even more. Then, in my mid-20s, I discovered the poetry of Pablo Neruda, arguably the greatest writer of both the sea and the nature of love the world has seen. By now I was desperate to go to Chile, but my dreams were put on hold owing to marriage, work, children, all the usual things. Aside from a couple of schemes (largely involving Al Mackinnon and the search for swell), I'd just about given up. But then, a couple of weeks ago, Rip Curl asked me if I'd like to go to Chile to report on its ASP Pro event at Arica. It was obvious - I had to go. But wait... 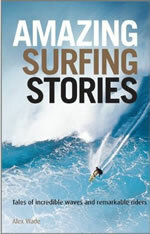 I have a book about surfing coming out in 10 days or so. Surf Nation brings a host of commitments, including a launch do next week at The Secret Spot in St Ives. Not only that but I'm off to Madeira in July, and it's one of my son's parents evenings at his new school soon... And as my beloved pointed out, I've been to Portugal, France and Scotland in the past two months. So all in all, I had to say no, and stay put. But I wish I was there. The Chilean Pipeline looks awesome, and sources tell me that Rip Curl is hosting a superb event, one that is boosting the local economy no end as well as giving some serious stoke to Chilean surfers. Taj Burrow, Andy Irons and Kieron Perrow are through their heats, and I'm plotting a way to get to the country that I've wanted to visit more than any other. I'll get there one day. Meanwhile here's a trailer to whet your appetite.